Rising temperatures caused by climate change may cost the world economy over $2 trillion in lost productivity by 2030 as hot weather makes it unbearable to work in some parts of the world, according to U.N. research published on July 19, 2016. It showed that in Southeast Asia alone, up to 20 percent of annual work hours may already be lost in jobs with exposure to extreme heat with the figures set to double by 2050 as the effects of climate change deepen. "Current climate conditions in tropical and subtropical parts of the world are already so hot during the hot seasons that occupational health effects occur and work capacity for many people is affected," said Kjellstrom, a director at the New Zealand-based Health and Environment International Trust. He said the increasing need for rest "is likely to become a significant problem" as climate change makes the hottest days hotter and leads to longer periods of excessively hot days. Kjellstrom authored one of six papers on the impact of climate change on health that were put together by the United Nations University's International Institute for Global Health in Kuala Lumpur and published in the Asia Pacific Journal of Public Health. The other papers in the series showed around 2.1 million people worldwide died between 1980 and 2012 due to nearly 21,000 natural catastrophes such as floods, mudslides, extreme heat, drought, high winds or fires. In Asia Pacific, 1.2 billon people have been affected by 1,215 disasters - mostly flood, cyclones and landslides - since 2000. In April, 175 countries signed a Paris climate deal to restrain the global rise in temperatures to "well below" 2 degrees Celsius (3.6 degrees Fahrenheit) above pre-industrial levels. The first three months of 2016 have broken temperature records and 2015 was the planet's warmest year since records began in the 19th century. 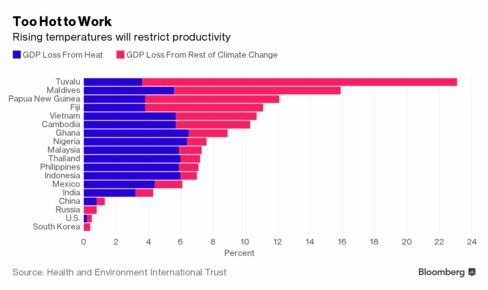 As many as 43 countries, especially those in Asia, including China, Indonesia, and Malaysia, will experience declines in their economies because of heat stress, says . As a result, China’s gross domestic product would be reduced 1 percent and Indonesia’s by 6 percent by 2030. Demand for air conditioning in offices, shopping malls and homes is likely to soar as temperatures rise, placing a strain on power supplies, according to the paper. A city the size of Bangkok may require as much as 2 gigawatts of generation for each increase of 1 degree Celsius in temperature, the study concluded.